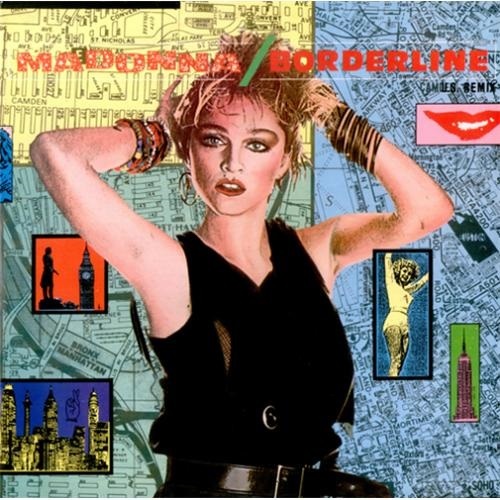 This week, 27 years ago, Borderline entered the UK Top 100 singles chart. Two weeks after its #74 debut, Borderline peaked at #56 – a position greatly improved upon by its January 1986 re-release, which reached the more-deserving #2 – held off the top spot by Billy Ocean’s four-week reign at #1 with When The Going Gets Tough (The Tough Get Going). “I really have a simple process for songwriting for an artist that I’m producing, assuming it’s not going to be a collaborative process. Firstly, I’ll listen to the artist’s demo tape or previous records, just to get a feel for their voice and style. Then, if at all possible, I’ll attend a live performance of the artist. I was fortunate enough to be able to do both of these things with Madonna. the beats within: Borderline sounds almost like a 1980s update on the Motown sound. Madonna of course hails from Michigan and has spoken about how the local sounds of Motor City were ever-present throughout her childhood; citing Motown girl groups like The Supremes as influences. Were you consciously inspired by Motown when writing Borderline? the beats within: Apart from being a great pop song, the success of Borderline was partly thanks to the music video for the song that heralded the beginning of Madonna’s relationship with MTV. What did you think of the video and were you surprised at the success of the Borderline single? -that may be Madge's biggest victory of all! MADONNA ROCKS! Physical Attraction was registered as written by Madonna in 1982 and then re-registered as a composition by Lucas. Considering the song is structurally and melodically very different from Borderline and at the same time very similar to other Madonna penned songs, wouldn't you think Warners and Madonna agreed to give him credit and all royalties on that track as a form of payment for his production on the whole recording session that were going on for the first album when Attraction went to clubs and appeared on the B side of Burning Up? fantastic post. nothing beats the first album. its timeless and perfection - 28 years in. G, im convinced that crimes of passion was the seed that eventually became physical attraction. i think shes responsible for more of that song than we know. G and Pud - You're both absolutley right to bring up that copyright evidence that Bruce Baron (my divine inspiration!) first uncovered several years ago. But I think we need to weigh up the other evidence on the table here. According to Reggie, he was originally asked to write/produce the follow-up to Everybody and the success of Burning Up/Physical Attraction was dependent on him getting the album gig. So, not quite sure about your theory about this being some kind of deal re payment for the album, as the album hadn't yet been given the green light. I was aware of the conflicting copyright registration before I spoke to Reggie, but from his account, he wrote the song. Reggie - who's a real gent - was more than forthcoming, very frank and honest in his interview with me. He has rarely (if ever) spoken about his work with Madonna - and in fact, his account of things (backed up several others who I've spoken to who worked on that album) differs greatly from the some of the "myths" that surround the making of M's first album. Plus, it goes without saying that Reggie Lucas is a true musician and songwriter and he has written or produced many songs that are structurally and melodically very different to eachother. Look out for more from my exclusive interview with Reggie in the future! have even uncovered conflicting evidence re who actually wrote Borderline, but this needs further investiagtion. Madonna - care to shed any light on this? Steve Bray has stated that he was surprised to discover that "Physical Attraction" was credited to Reggie Lucas, because he thought Madonna had written it. Since Madonna and Steve had fallen out by this stage over her decision to go with Mark Kamins and then Reggie as producers, this would suggest that Steve had heard "Physical Attraction" before Reggie came along. thebeatswithin, if you're still in touch with Steve, maybe you could ask him about this?